Papaya King is the classic hot dogs and tropical drinks shop. Called by Zagat the "best, cheapest (stand-up) lunch in the city". A quintessential New York experience that's embraced by all kinds of customers. Papaya King is a well known brand with a simple and scalable operating model. The 86th street location is among the highest grossing restaurants (per square foot) in New York. 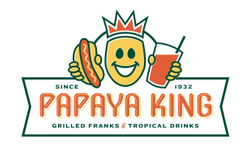 Say the words "Papaya King" and franks and tropical drinks will instantly come to mind. Papaya King has been called by Zagat the "best, cheapest (stand-up) lunch in the city" and “more vital than the subway.” Critic Ed Levine of New York Eats calls it the "best hot dog in the world" and Julia Child and Anthony Bourdain both agree it’s the best hot dog in New York. Over the years, Papaya King has played host to movie stars, rock stars, presidents, business titans, and most importantly, New Yorkers and visitors from all walks of life. Customers and large scale strategic partners have embraced the brand worldwide. Papaya King is a democratic concept that appeals to all economic, demographic and psychographics. Quintessential (and filling) New York culinary experience for less than a Venti Starbucks latte. Competitors in the hot dog space have minimal focus on brand, quality, service or experience creation. Simple menu with high gross margins, small required footprint and low CAPEX requirements. The 86th Street location is one of the highest grossing restaurants (per square foot) in New York. The operating model is simple and transportable with scalability in mind including template floor plans, signage, menus, uniforms, vendor rationalization, and design. Papaya King is listed in the Franchise Directory under the Food category. It's also listed in the section for Franchises Under $1,000,000.